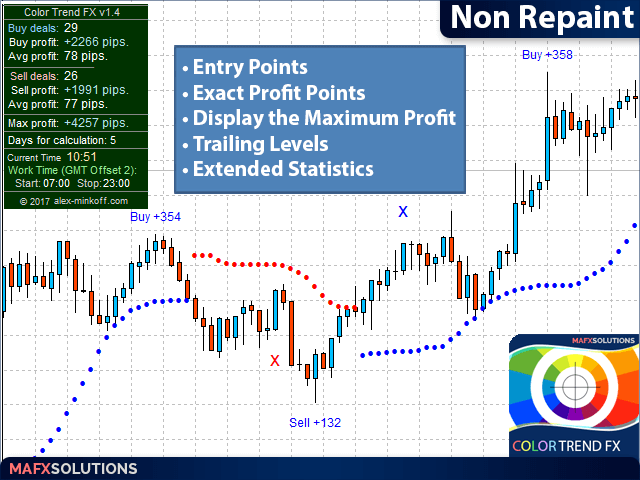 The Color Trend FX indicator shows on the chart the accurate market entry points, accurate exit points, maximum possible profit of a deal (for those who take profit according to their own system for exiting deals), points for trailing the open positions, as well as detailed statistics. 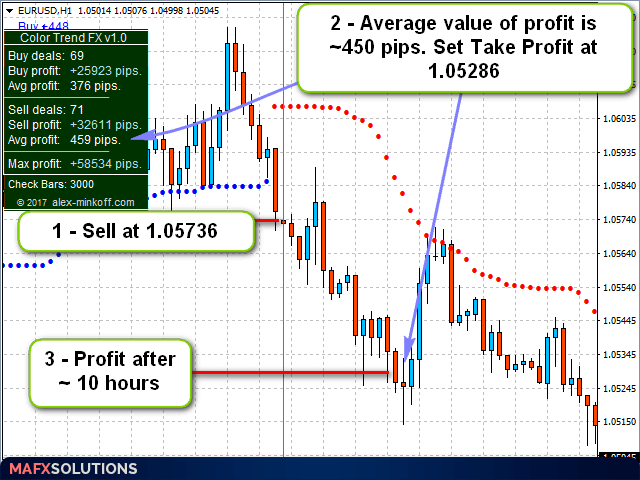 Statistics allows to choose the most profitable trading instruments, and also to determine the potential profits. 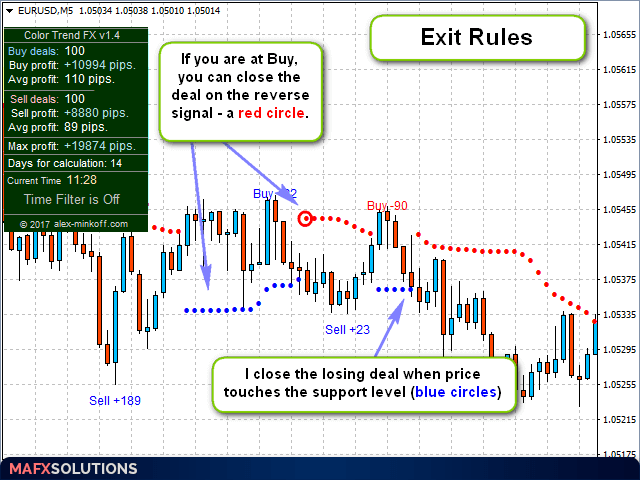 The indicator does not redraw its signals! 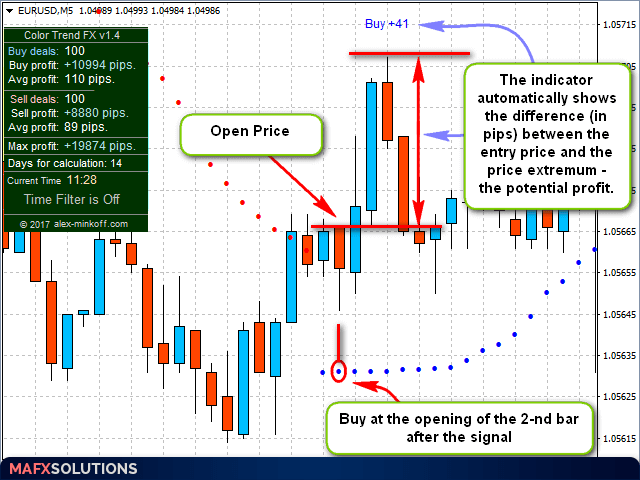 The indicator is simple to set up and manage, and is suitable for beginners, advanced and professional traders. The indicator is a part of my portfolio of tools for trading, therefore, it will be constantly upgraded and supplemented with new features, which will be available to all my clients. I would be grateful for your feedback! 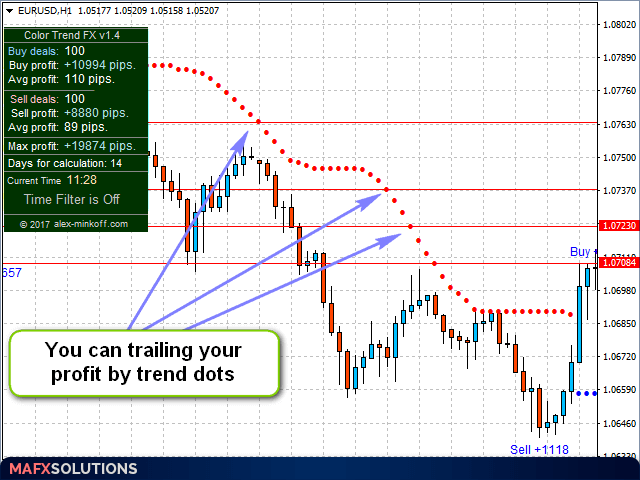 Delta to Draw Arrows (in Pips) – offset in pips to display the signals on the chart. GMT Offset – shift relative to GMT. ‌CurrentColorSell - color of sell signals on the current  bar. Send an Email - send emails to the address specified in the settings. 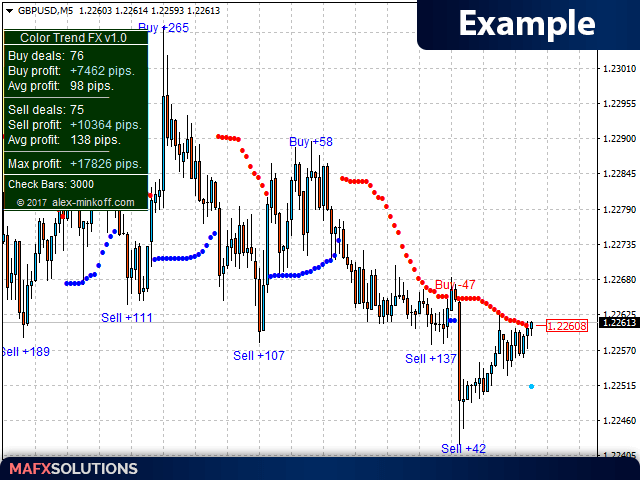 The purpose of the instrument is to show accurate entry points, points for trailing open positions, exit points. 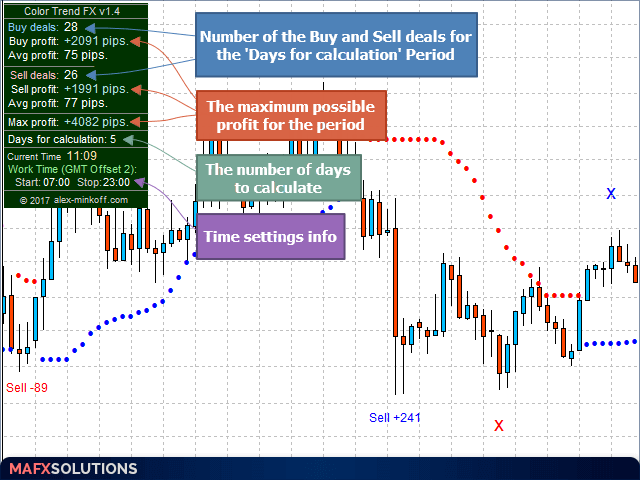 It also displays statistics on the possible potential profit for the current instrument and timeframe. 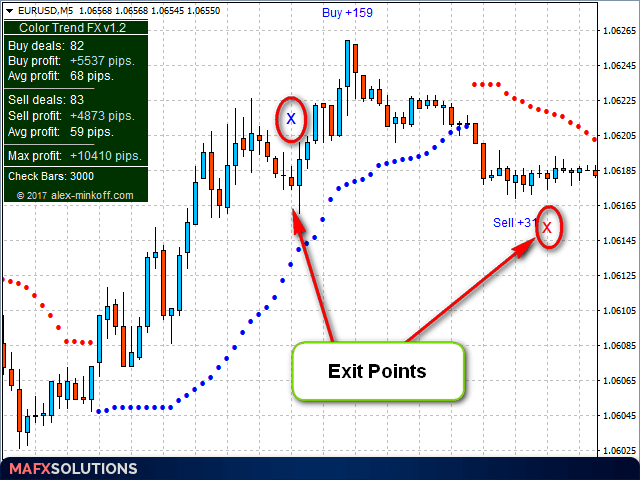 It is not recommended to trade during important news releases, in order to avoid false entries! 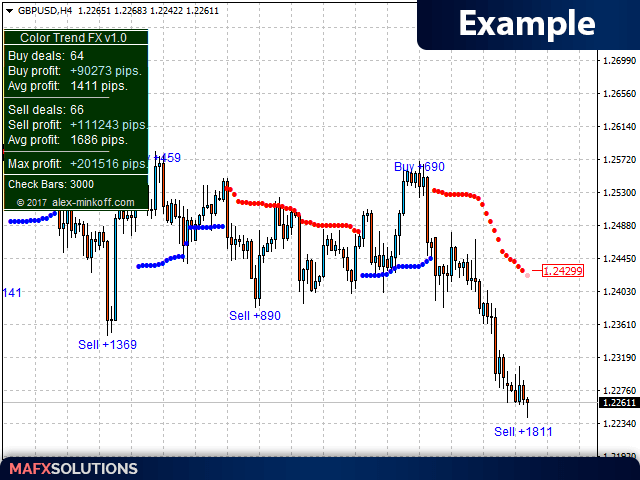 It is not recommended to trade on a low-volatility (flat) market! 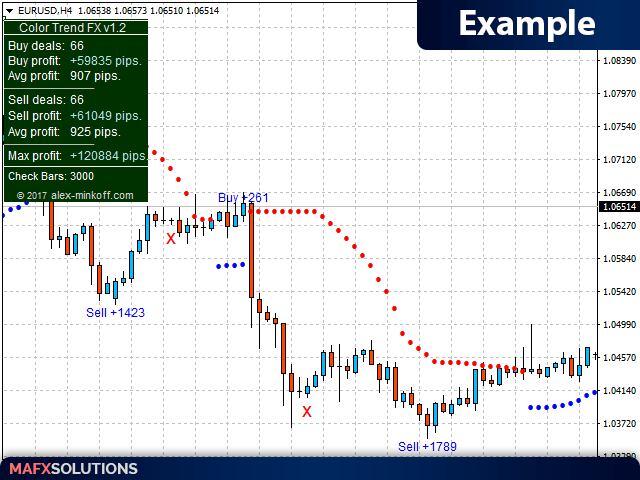 By analyzing different pairs and timeframes, you can choose the most profitable pair and timeframe suitable for your style of trading. Knowing the average profit on the current instrument and timeframe, you can select the average profit level for next trades.